In the coming decades, India will have the distinction of having the largest populations of two of the three largest religions in the world – Islam and Hinduism – according to new religious projections data from Pew Research Center. India is already home to most of the world’s Hindus. In 2010, 94% of the world’s Hindus lived in India, and this is expected to remain true in 2050, when 1.3 billion Hindus are projected to live in the country. But India also is expected have 311 million Muslims in 2050 (11% of the global total), making it the country with the largest population of Muslims in the world. Currently, Indonesia has the world’s largest number of Muslims. Muslims are expected to grow faster than Hindus because they have the youngest median age and the highest fertility rates among major religious groups in India. In 2010, the median age of Indian Muslims was 22, compared with 26 for Hindus and 28 for Christians. Likewise, Muslim women have an average of 3.2 children per woman, compared with 2.5 for Hindus and 2.3 for Christians. Due to these factors, India’s Muslim community will expand faster than its Hindu population, rising from 14.4% in 2010 to 18.4% in 2050. But, even with this increase, Hindus will make up more than three-in-four Indians (76.7%) in 2050. Indeed, the number of Hindus in India will still be larger than the five largest Muslim populations in the world’s biggest Muslim countries (India, Pakistan, Indonesia, Nigeria and Bangladesh) combined. India also has a number of smaller religious minorities. In 2010, approximately 2.5% of the country’s population was Christian, including members of Scheduled Castes (historically referred to as Untouchables or Dalits) who sometimes identify as Hindu when completing official forms. 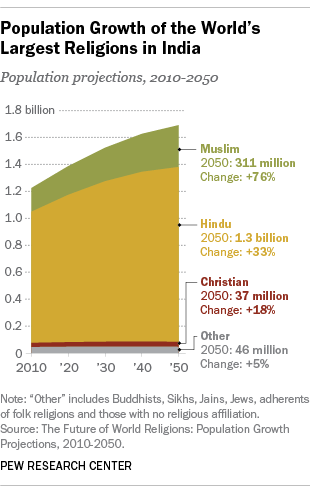 Christians are expected to make up 2.2% of India’s population in 2050. Religious turmoil (between Muslims and Hindus, but also involving Sikhs, Christians and others) has long been a fact of life in India. The year the country won its independence from Britain, the Indian subcontinent was partitioned along religious lines, into Muslim Pakistan and Hindu India. Even though the separation was intended to ease religious tensions, it led to a spasm of violence that left up to a million dead and more than 10 million displaced. In the nearly 70 years since independence, religious violence has claimed thousands more lives, including that of modern India’s founder, Mahatma Gandhi, as well as Prime Minister Indira Gandhi. A recent Pew Research Center report on religious restrictions found India to have one of the highest levels of social hostilities involving religion in the world. Even India’s current prime minister, Narendra Modi, has been dogged by allegations of religious intolerance, stemming from anti-Muslim violence in the state of Gujarat in 2002, which according to some estimates killed as many as 2,000 people. Modi, who was chief minister of Gujarat at the time, has been accused of not doing enough to stop the killing because he is leader of the Hindu nationalist Bharatiya Janata Party and the violence was perpetrated by Hindus against Muslims. Correction: An earlier version of this post described Narendra Modi as a former governor of Gujarat. He was formerly chief minister of the state.